The first one thousand days in a child’s life could hold the key to unlocking his/her life-long potential. By the age of 5, almost 90% of a child’s brain will be developed. These are the formative years where factors such as adequate healthcare, good nutrition, good quality childcare and nurturing, a clean and safe environment, early learning and stimulation will, to a large extent, influence his/her future as an adult. 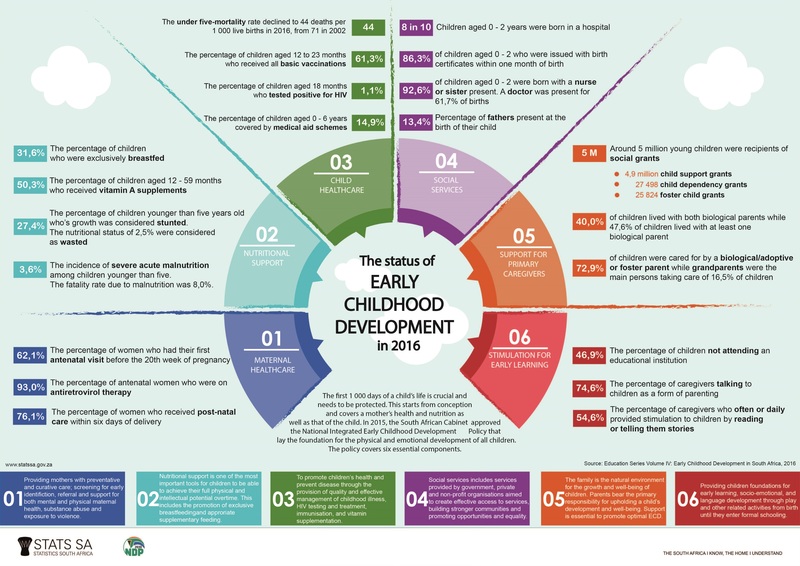 According to a new report released by Statistics South Africa based on the findings of the General Household Survey data, Early Childhood Development in South Africa, 2016, there were close to 7,2 million children aged 0–6 in South Africa in 2016. 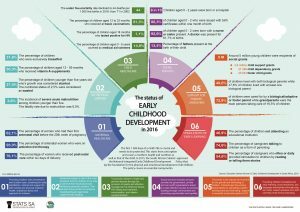 The report focuses on the latest evidence in early childhood development of children aged 0–6. Development of a child begins as early as the start of a woman’s pregnancy, and good nutrition and medical care for the mother is therefore essential in order for her to deliver a healthy child. During the period of 2015–2016, 61% of pregnant women made their first antenatal visit before 20 weeks and the antiretroviral treatment (ART) coverage for pregnant women was 93%. This intervention has had a significant impact on ensuring that children born to HIV-positive women stay HIV negative and healthy. Close to 35% of pregnant women stayed in households that ran out of money to buy food for five or more days in the 30 days prior to the survey. Efforts to encourage mothers to breastfeed have yielded positive results. The report shows that in 2016 close to 73% of children aged less than one year were breastfed, while 32% among the same age group were exclusively breastfed. Breastfeeding remains the most nutritious, affordable and safe feeding option for young children. In spite of these gains, malnutrition remains a serious challenge in South Africa. Approximately a third of children in Gauteng and Free State were stunted as a result of chronic malnutrition. South Africa also had one of the highest low-birth-weight rates with a 13,3% occurrence of live births of babies under 2,5kg nationally. The country also had a high underweight-for-age incidence with 21,3% occurrences nationally in 2016. These disorders often lead to child deaths; in 2016, the rate of deaths associated with severe acute malnutrition among children younger than five was eight per cent. Inadequate prenatal care and poor child feeding practices contributed to high early-childhood-mortality levels. Nationally in South Africa, the under-five mortality rate and the infant mortality rate were 44 and 34 deaths per 1 000 live births, respectively. The environment in which children grow up also plays a role in their cognitive and psychosocial development. Activities that involve playing, singing or reading and that stimulate the brain through all the senses can help improve their ability to think and communicate. Children living in poor households, where parents are less able to spend time or money to feed and educate them, may grow up in a less stimulating home environment. A breakdown by monthly household income quintile revealed that close to half of the children in the lower household income quintiles did not attend any educational centre, while 40% of the children in the highest household income quintile attended out-of-home early learning programmes. Children in mostly black African families received suboptimal stimulation as 31% were never encouraged to imitate daily activities and 35,2% were never given answers when they pointed at objects and asked for explanations. Children in poor households may thus start life at a disadvantage and can fall further behind their more advantaged peers throughout their lifecycle.